In the following picture you will see a very interesting phenomena. The plane is above the clouds with the sun behind. 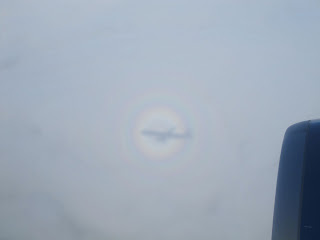 You can see a shadow of the plane, but the more significant thing is the perihelia around the shadow. It was the day for that image. I had several opportunities for pics and I took a little film as well. You can see two distinct rings in the pic. The plane has a relatively sharp edge and the diffraction caused by the plane produces a nice series of rainbows projected on the clouds, I think. Very nice. We call this a Halo in Hang Gliding. Every once in a while we'll get above the clouds (probably because we were towed there). I've seen my Halo once when I was in Florida... then we flew right through it!